Uncoloured aquatint with etching of Garden Reach in Calcutta by James Moffat(1775-1815) one of his 'Views along the Hooghly' published in Calcutta in 1798. 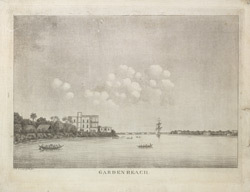 Garden Reach, a suburb of Calcutta, was an area on the River Hooghly where many Europeans built large 'Garden Houses' with grounds sweeping down to the river's edge. The row of palladian mansions lining the river approach to the city provided an impressive view and made this one of the most fashionable areas of Calcutta. The wide distances between the houses were so designed in the belief that it would reduce the spread of disease by aiding air flow.